After a solid four weeks at the top of the pile Marvel's "Captain America: The Winter Soldier" has finally been ousted by another American superhero. 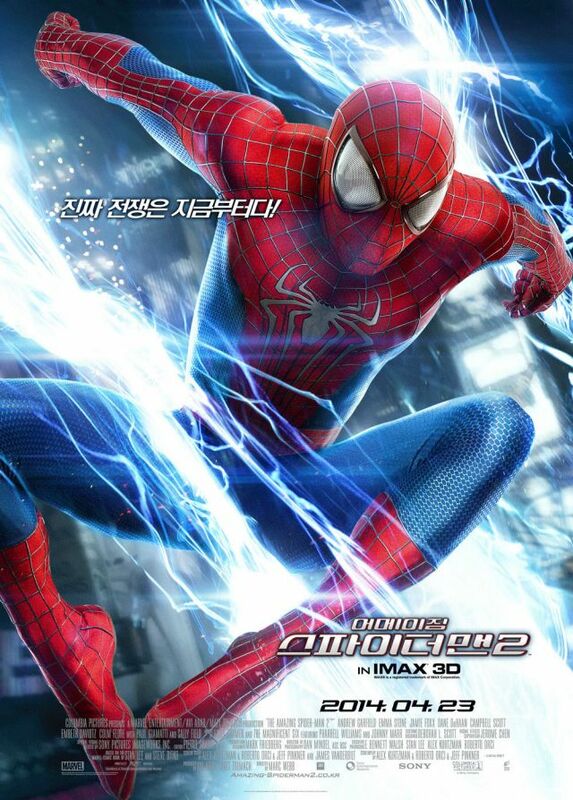 "The Amazing Spiderman 2" swung into contention this past week and swept the competition cleanly aside, clinging onto more than 72% of the total ticket sales and racing to 1.6M admissions. The web-slinger opened its Korean account to 1,312 screens, more than double its closest rival "Mr. Peabody & Sherman" which also entered the fray but had only 533 venues to campaign from. "Mr. Peabody & Sherman" is based on Ted Key's animated series "Mister Peabody" from the 1950s/60s, and is the first DreamWorks picture to pull from its Classic Media library (now DreamWorks Classics) since the studio acquired it in 2012 for $155M. DreamWorks has already made $260M worldwide from its $145M effort, and over the weekend 126,796 Koreans came out in support during its opening weekend. Still, Marvel dominated as it timely tagged Spidey into the Korean market and made a clean switch from "The Captain" (which managed just 107,134 – 5.5%) to Parker and his high-flying action antics. In fourth, and down just the one place, was Lee Jeong-ho's crime thriller "Broken" starring Jung Jae-young and Lee Sung-min. Last week Lee's second feature claimed 189K, but managed just 87K (4.6%) in week two. "Broken" current sits on 958,997 admissions ($7.2M), and Lee will be hoping his latest has the legs to surpass his debut effort "Bestseller" (2010) which raked in just over a million admissions. The science fiction action film "Divergent" was next with 58K (3%), followed in sixth by the critically acclaimed drama "Han Gong-ju". Lee Su-jin's debut film "Han Gong-ju" entered into the chart last week and over the weekend added 47,377 (2.5%) to bring its total tally now to 141,558 admissions ($1M). "The Grand Budapest Hotel" was recently confirmed as Wes Anderson's highest grossing film to date, making over $131M worldwide. In Korea, however, the film has not caught fire but has remained a steady feature in the charts since its release late last month. "The Grand Budapest Hotel" claimed 36K (1.6%) over 155 screens, a modest haul that bumped its total tally to 676,193. Rounding out the weekend's top flicks were "Son of God" (24K – 1.2%), the true-life inspired "Paganini: The Devil's Violinist" (10K – 0.5%), and the American romantic comedy "The Face of Love" (8K – 0.4%).